DELICATE CONJUNCTION: Circle this date on your calendar: April 8th. On the evening of that Tuesday, the 12% crescent Moon will graze the Pleiades star cluster. The sight of these two delicate heavenly bodies in beautiful conjunction is best enjoyed through binoculars or a small telescope, but the naked eye works, too. Don't miss it: sky map. In Rollwagen's movie of the flyby, the spacecraft seem to vanish in mid-flight; that happens when they enter the dark shadow of Earth. "The cargo carrier flew in tandem almost 8 seconds in front of the station--a real distance of about 60 km," he says. 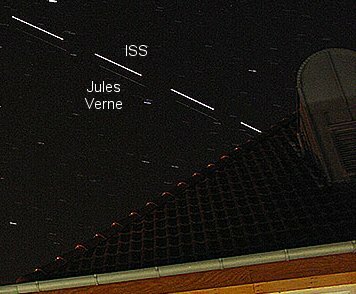 The distance will shrink further tonight, March 31st, when Jules Verne approaches the ISS again, stopping only 11 meters from the docking port and then backing away. This is practice for an actual, automated docking on April 3rd. European sky watchers can see these events with their own eyes as the two spacecraft fly over their continent in the evenings ahead. 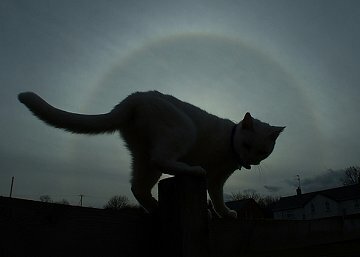 SUN CATS & DOGS: Last week over Maghera, Northern Ireland, a bank of icy clouds drifted across the sun and formed a luminous halo. "My cat jumped onto the garden fence," says onlooker Martin McKenna, "so I used 'Gizmo' to block the sun's glare and take this picture." McKenna looked around for the sundogs which so often accompany circular halos--and, lo, "there was my own dog 'Benson.' The halo was also reflected from a puddle at my feet. All in all, a very good show!" On March 31, 2008 there were 946 potentially hazardous asteroids.